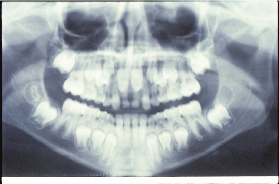 It is interesting how often unusual orthodontic situations can be discovered with a simple exam and X-ray. Just this week I have diagnosed young children (8 to 10 years of age) with multiple missing permanent teeth and/or supernumerary (extra) teeth. Both missing permanent teeth and supernumerary teeth are common conditions, and they can only be first seen with an X-ray. This is because permanent teeth form underneath baby teeth long before they ‘push up’ to the surface of the gums. By seeing where and how teeth are forming (as well as how many), an orthodontist can adjust a patient’s treatment plan accordingly. Supernumerary teeth can mean crowding for existing or future permanent teeth, or these teeth could possibly come in at other places in the mouth. A lack of permanent teeth, on the other hand, results in gaps and spaces. Fortunately, there are many treatment options available whether a patient will have too many–or not enough–permanent teeth. A combination of timely extractions, oral surgery, orthodontic treatment, or cosmetic treatments will make sure a child will have a great looking smile as an adult. In both cases I saw this week, these diagnoses made a significant impact on the patients’ treatment plans. Although their treatment (braces) will not happen for a year or two, we were able to make sure the treatment works best at that time through the use of X-rays. Treating a patient whose permanent teeth are still coming in and changing makes this process more difficult. So if your child has not seen an orthodontist by 8 or 9 years of age, please schedule a consultation soon. The earlier your child’s orthodontist knows how his or her teeth will come in, the easier the treatment process will be. It can really make a difference.